Hello! This is an extensive guide on the topic of leading a successful Regiment in Holdfast: Nations at War. My name is Bailey, better known as Haybales in the community; and I currently lead the King's Royal Army which is identified as the largest community (casual) based group in the game at the time of this writing. This guide will dive into every aspect of building a Regiment of any function - whether it be casual, communal, competitive, realistic or roleplay based. The guide will be broken down into 3 sections - so feel free to scroll to the appropriate section if you're looking for something specific. Feel free to comment any additions, suggested modifications or feedback/comments regarding the guide or the topic! Firstly, is your Regiment going to be British, French or Prussian, or are you looking to make a Regiment of an alternate faction that isn't yet included in the game? Keep in mind, at the end of the day this is a video game - and you won't be scolded for not following every historical accuracy of your chosen group. You should choose your name based on availability and personal preference. If you're looking to create a light infantry/skirmisher regiment, pick an appropriate name to publicly represent yourself as such - this is the same across all forms of Regiments, whether it be Line, Cavalry, Artillery, Lights, Guards etc. IMPORTANT: Make sure your name isn't taken on the Official Regiment & Crew List before you go any further with your Regiment. If you're looking for inspiration, there are some fantastic compilations on the Total War Center for you to browse. A list of British Army Regiments can be found here. A list of French Army Regiments can be found here. A list of Prussian Army Regiments can be found here. Reserve the name on this thread with the appropriate template. Create a forum post on this board. Once you have 5 members, apply for the Regiment Leader's Steam Group. 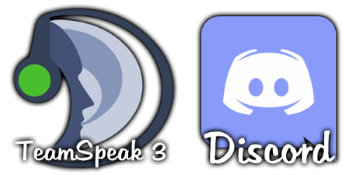 There are two services that the Regimental community use for communication - TeamSpeak 3 and Discord. Both services have their advantages and drawbacks, and every current Regiment likely uses one of these services. Either one will work fine, but you are encouraged to do your own research into what either platform can do for you before choosing where you want to go! The primary function of either service will be: a place to vocally communicate for hanging out & playing events and a way to track who holds what rank in your Regiment. Discord can provide you with text & voice channels, but struggles with depth of server roles/permissions - causing some frustrations when it comes to setting up how your ranks interact with channels and other members. Newer and more casual groups tend to favor Discord. TeamSpeak 3 is essentially exclusively voice based communication - but has a very well designed server group/permissions system which allows you to be a little more intricate with your ranks and how they interact with the rest of the Regiment. Older (competitive) Regiments and M&B: NW groups tend to favor TeamSpeak 3. IMPORTANT: I do recommend downloading both of these services regardless of your chosen platform - to make networking easier in the future. Head over to your steam profile and select Groups from the dropdown menu. You'll want to create a new group and use the following information. Please note, Steam does not let you change a group's name later - so make sure you don't have any typos before hitting enter. You'll need a steam group to track members, and be able to post announcements regarding upcoming events, trainings & activities that your Regiment hopes to participate in. It's a central hub of your group. Group Name | Your Regiment's full name. Abbreviation | For example, the "21st Regiment of Foot" may be the "21ROF". Group Link | Again, I would recommend using the abbreviation you just created for this. Public Group? | Do not check this. It will make roster management hell later down the line. Draw up an idea of what you want your ranking structure to look like. While I remind you again this is a video game, your ranks should have some kind of legitimate reflection to your Regiment and it's history - for example, using a French ranking structure (and the French language) for a British Regiment of Foot is probably not favorable for you. Below are the very basic ranks of each faction currently featured in the game - a quick google search will find anything else you need. In addition to this section, I highly recommend getting a small group of what will be your "High Command", leading a Regiment alone is well & good up to a certain number of members, then you may wish to consult additional trustworthy members on ideas, and have some help when it comes to the administration and management of the group. In my personal opinion, there are three types of Regiment in Holdfast: Nations at War. While you don't have to brand yourself to one of these right now, keep in mind that your recruitment material and appeal will revolve around what type of Regiment you wish to be. Potential recruits may be looking for a specific type of group, so you should be ready and know what you're looking for in members. Casual | A Regiment/Group that isn't big on history, more of a "gaming community" that wants to enjoy the game on a casual level of public servers & public linebattles. Competitive | A Regiment/Group that intends to participate in leagues & tournaments in Holdfast: Nations at War. Usually lots of training/events to become "the best there is". Realistic | A Regiment that dedicates themselves to the historical accuracies of the time period; through ranks, names, presentation and such. Fantastic. You've got the basic logistics behind your Regiment down, and you're ready to start growing with the community. You should start working on how you want your recruitment campaign to look, and how you want to publicly present yourself to the rest of the Regimental community. You're the new guy on the block, let's get some contacts. While you can search through the in-game Regimental tags and try and seek people through Steam to add and make yourself notable, there are already some established communities that can allow you to contact Regiments and members of the community too. 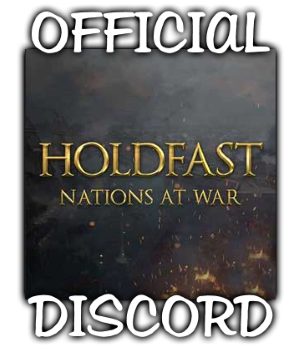 The Official Holdfast Discord Server and the Unofficial Regimental Discord Server can immediately grant you a membership to the Holdfast community, and will allow you to begin to get your name out there. While some regiments will be more welcoming than others, you're sure to find some chaps who can help you on your way in the regimental community. Click either (or both) of the below images to connect to the Discord(s). There are two primary ways to push your Regiment out there and seek members. Although other methods such as word of mouth, in-game leadership, social media and contacts may also help you with recruitment and community growth - below are the two primary methods of which current Regiments present themselves. 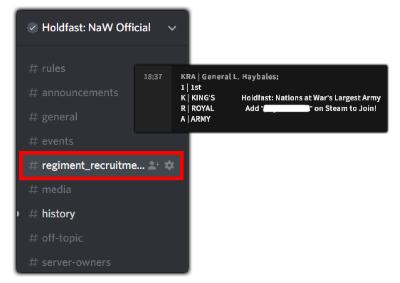 Additionally, your Holdfast thread should be considered your Headquarters - the main page that displays everything there is to know about your group, it's direction and most importantly what you can offer to recruits. You're welcome to post about your Regiment in any of the Official Servers of Holdfast. Please note, there is an attached rule to this privilege. 5. A regiment may advertise once per five minutes on server. This limit is counted by regiment and not by individual player, so having multiple members post advertisements sequentially within the five minute period is still considered spam. This applies to advertisements, both general and individual. This also includes messages for an entire group such as an army etc. Other media such as YouTube channels, Twitch, accounts, Facebook pages and so on, are included in this rule. Some Regiments will include their current member count, total # of attended events, win/loss records, a "slogan" and other information that may be appealing to the public. You can usually find the in-game chatbox flooded with these recruitment messages, so again, feel free to take inspiration from active successful groups - but don't directly copy them as this will affect your reputation among the Regimental community. You're almost there. Everything is set up, you've got your roster set out, a clear method of communication and a central hub for your group. Now you get to enjoy the game, and enjoy the main reason why chaps form Regiments in the first place - events! Linebattles are of course the premier type of event in Holdfast: Nations at War, and by god they're enjoyable as all hell. If you're not sure what a linebattle is, go ahead and check this video out. This page displays all active events that are seeking new Regiments. Have a browse and sign up to some events that are appropriate to your group timezone. Courtesy of Blaze, you can find a list of active events divided by timezone on this thread. All that is left is to stay active among the community, and most of all bloody enjoy your time with a group! Stay active in the game, and make yourself known as a friendly group of British redcoats of a fearsome force of French turncoats. You should enjoy your time with your Regiment, and have some really good fun in the linebattling and integrated community. 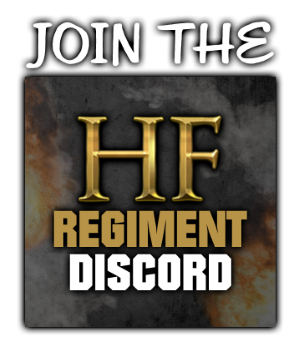 Feel free to ask for help on the Holdfast/Regiment Discord! Feel free to ask about linebattles, ask about graphics, ask about ranks! My point is, feel free to ask questions to established groups. Most regiments in this alpha game are looking for the game to develop, and by extent, are looking for the community to grow and develop too. Regiments will be happy to help out to a certain degree, so ask questions to the veterans to make your group the best it can be. Above all, have fun. This is a video game, and in the case of Holdfast: Nations at War - It's a lot more fun with friends. Have at it! This is fantastic Haybales! One thing to add is don't forget to ask your fellow regiment leaders for help! We have helped provide Holdfast Servers, Teamspeaks, trainings and even guidance on leading in game. If you have any questions feel free to add me on steam and ask away! One of the many things that someone from FSE didn't bring over. I'm glad it finally got done by someone. Appreciate it Glofer. I did mention connections in the outro! Great guide!, I'm sure this will help many newer members joining the community and are looking for ways in how to effectively setup a regiment. Looks great! Good post, very helpful to those looking to start out in the regimental scene. The biggest emphasis I would have is make sure you pay attention to the members in your regiment, they're the backbone and what makes it great! Make sure everybody is having a good time to the best of your ability, and you'll see a lot of success. Awesome topic, good job Haybales and good luck to anyone making a new regiment!